We are very excited to announce The Silver Mountain Experience’s First Heritage Weekend (Llywernog:1870). Take a peek below at what you can expect from our brand new event! SCANDAL AT THE MINE: During the Eighteenth and Nineteenth centuries mine managers would often write overly boastful accounts of their mines to attract investors and thus rival their competitors. The mining frauds of Mid Wales are just one of the many fascinating aspects involved in this great local history. Mining production is facing competition from overseas. ‘Llywernog silver-lead Mine is positioned in the heart of the richest mineral district in Cardiganshire, and has been heavily wrought since about the year 1750. The main shaft, Hanson’s, has been sunk to the 72 Fathoms Level, and has intersected the junctions of four rich veins of silver-lead ore. There are nine levels of vast importance over a vertical height difference of 520 feet, from which hundreds of tons of silver-lead ore have been extracted. Would you invest in this great mine? 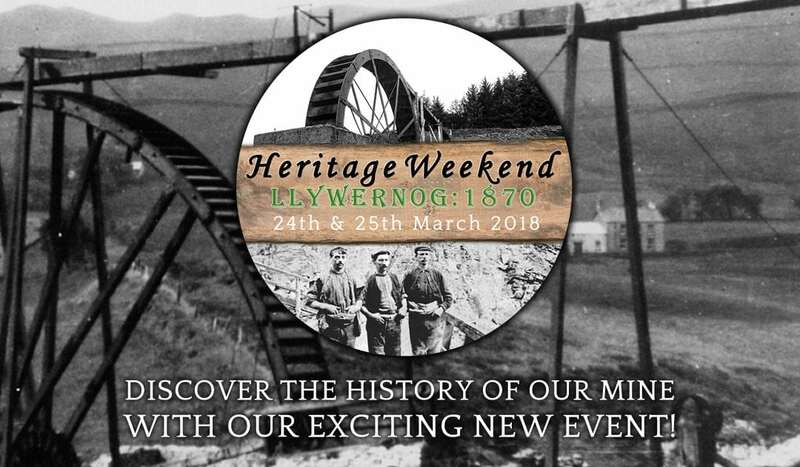 Llywernog Silver-Lead Mine near Aberystwyth is travelling back in time to 1870, and the Silver Mountain Experience warmly invites one and all to join them at their first Heritage Weekend (Llywernog:1870)! With FREE ENTRY * to the event, there is an abundance to be explored. With the help of members of the Welsh Mines Preservation Trust and Cambrian Mines Trust, a vast amount of work has been going on to restore the great Ore Jigger Machinery and run the Buddle and Jigger Waterwheels, the grand unveiling of which will be on the Heritage Weekend, where some equipment will be running for the first time in over a century! There will be fun and interactive activities going on throughout the weekend, which delve deep into this incredibly fascinating history of our mine. Interactive shows, demonstrations and talks will be running throughout the event. You can also enjoy one of our adventurous tours*, including a hunt for our shy Dragon in ‘A Dragon’s Tale’ for younger guests, or for those who are feeling braver, take on Welsh myth and legend in our frightful underground experience ‘Black Chasm’. A Mining Memorabilia stand will be present, where visitors will be able to see mining-era artefacts, documents, photographs and books brought in by local organisations and the community. Some of these fascinating items include collections and facsimile material from the Ceredigion Museum and Ceredigion Archives. Visitors are also invited to bring their own possessions in from the era, and will have the opportunity to enter the ‘Most Unusual Competition’: selected entries will be posted on their Facebook page in the week after the event, with the final winner taking the amazing prize of a Silver Mountain Experience Annual Pass for two people! Bring anything that you think may be related to mining, and our mining experts will also do their best to identify and tell you more about it! The Royal Commission on the Ancient and Historical Monuments of Wales’s youth panel will help you make ‘Mini Map Badges’ or have a go at a ‘Hat Snapshot’. The Mining Museum, Fossil Dig, Gem Panning and other attractions will all be open, and children will be able to take part in historic dressing-up in the new kids’ Den. It is a great opportunity for stories to be shared and history to be discovered; John Balcombe was a figure of great importance in the local area, having been responsible for buildings such as the Queen’s Hotel, which was used as the Police Station in popular television series Hinterland. Llywernog Silver-Lead Mine dates back to the mid-1700s, and mining in Mid Wales back as far as 4,000 years ago! The Miner’s Life guided tour* and special features put on for the Heritage Weekend will allow you to step in to the footsteps of a miner, immersing you in the original and rare setting of the mine, both above and below ground. The Heritage Weekend will run from 10am to 4pm on Saturday 24th & Sunday 25th March 2018, at the Silver Mountain Experience. This is located at Llywernog, near Ponterwyd on the A44, only 15 minutes’ drive from Aberystwyth and 30 minutes from Llanidloes.